O’ Donovan Engineering are delighted to announce the launch of a brand new patent registered product; the Rubicle™. This newest addition is a cubicle with a soft-touch rubber cover which enhances your cows comfort while housed. The official launch will take place at Tullamore Show on the 9th August 2015, where the O’ Donovan Engineering team will be showcasing their full product range. 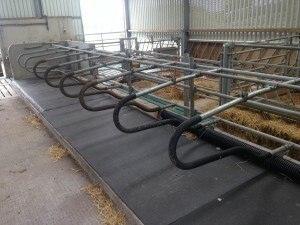 As shown in the picture the sleeve does not cover the entire cubicle but focuses on the contact areas with the cow. On a cold winter’s night would you prefer a bed with a warm electric blanket or one without? Your cows feel the same way! Both are comfortable – but the Rubicle™ is cosy. There are many advantages to cows spending more time lying down. Research shows that a cow lying down is more productive as blood circulation in the udder increases by approximately 25%. 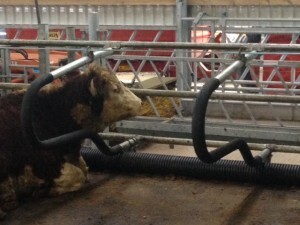 A combination of the Rubicle™ and quality comfort roll mat will maximise your cows herd health and productivity. The Rubicle™ soft-touch rubber cover is now available nationwide and can be fitted to new or existing cubicles.